Waldorf, Maryland - The Somerset Patriots have officially clinched the 2018 Liberty Division First Half Championship, and thus, a spot in the 2018 Atlantic League postseason. Somerset’s playoff spot was clinched Wednesday afternoon when the New Britain Bees lost to the Long Island Ducks. It marks the Patriots’ Atlantic League-record 19th Half Championship and ninth First Half Championship. It is the franchise’s fourth Liberty Division First Half Championship and seventh overall Half Championship under sixth-year manager Brett Jodie. 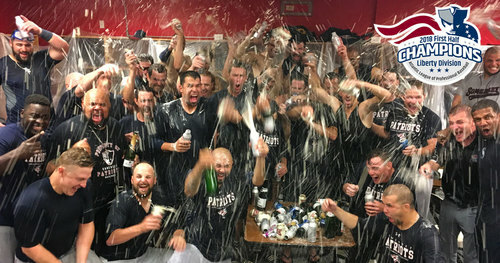 With a playoff spot now clinched, 2018 will mark the sixth-straight year that the Somerset Patriots will play in the Atlantic League postseason. They will have the option of choosing the dates of their home games for the Liberty Division Championship Series. Somerset will await the winner of the second half Liberty Division Championship for their opponent to be determined. The Sugar Land Skeeters have also clinched a spot in the postseason after clinching the First Half Freedom Division Championship on Sunday. More information on the 2018 Atlantic League postseason, along with when tickets will go on sale, will be announced at a later date.